Our Street Fighter 30th Tribute: Cammy White from Super Street Fighter II! Cammy White was one of the four new playable characters from Street Fighter II’s later installment ‘Super Street Fighter II: The New Challengers.’ She joined Chun Li as the second female character of the series. Like Chun Li her move set consists of very powerful kicks and agile jumps. Her fighting outfit was practical like Chun Li’s too, if not more simple and more revealing. 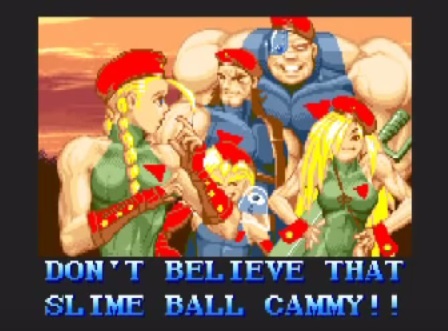 Unlike Chun Li however, Cammy has no memory of her past or her family. All that is known to her is that she was one of the “Dolls” working for M. Bison’s army in his Shadowloo criminal empire. She has undergone many of their inhuman mind-wiping techniques, as she can not recall past events due to the experiments given her amnesia. On every occasion she has confronted Bison to know more about the truth about her past; all that Bison reveals to her is that she was made to serve him! When Cammy rebelled and tried to save the other “Dolls” she refers to as “her sisters”, she managed to escape but wasn’t able to free them. She then awoke with no memory of the incident at the doorstep of British M16 military unit Delta Red. Although Cammy was distraught by Bison’s malicious words, her Delta Red comrades reminded her she had a new life to live with them and no longer needed to remember the past. She then departed with them, and would continue in future installments trying to take down Shadowloo and free her “sisters” for good. Cammy is one Street Fighter character that has undergone some major changes throughout future installments ever since her debut in Street Fighter II: The New Challengers. Among these changes was the North American version of her ending; where she seemed to be in a loving relationship with Bison rather than just be a copy of Bison to serve him. Her outfits have also undergone great changes; as her Alpha series outfit consisted of a blue turtleneck unitard with a military flight cap rather than her trademark green unitard with her red military police cap and camouflaged legs. Her initial design also underwent some changes; as she was originally meant to have an oversized 9mm uzi complete with rollerblades! As the second female fighter of Street Fighter II next to Chun Li; their fighting styles and attitudes do have stark contrasts. Cammy is more akin to launch attacks that spiral her towards her opponents rather than use more “in-place” fighting techniques like Chun Li. She also makes use of grappling moves more as she is able to suplex even tall guys like T. Hawk effortlessly. Her personality is also more cold and aloof than Chun Li’s usually happy and cheerful personality. This is due to her still complicated past. 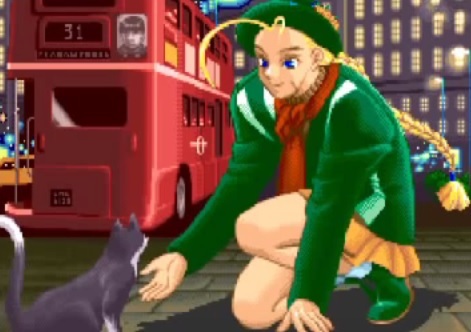 About the only thing that keeps Cammy happy is her Delta Red team, the “sisters” she has saved…and cats. Lots and lots of cats! After completing his rendition of Joe for the Street Fighter I tribute, he then took on Cammy White for Street Fighter II. His take on her with his beautiful comic rendering style is indeed a feast for the eyes! Victor “Vf02ss” Boggiano is one of the few artists from Peru that are a part of this community. His first contribution was also Street Fighter related and for our art contest in July when games that were released in 2016 were the topic. His first contribution to our Street Fighter Anniversary showed old-school Birdie, combined with some features of his later designs. He then took on both Akuma and Cammy White for Street Fighter II. 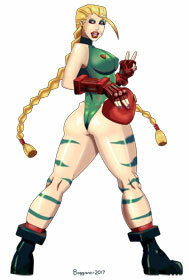 And I must say, his take on Cammy’s victory pose here is a real looker and winner for sure!